Is there anything you want the Flipside Community to understand about your piece? –When we were kids most of us recall a time period where, perhaps we’d go to the park and we’d see all these other kids playing and we could just run up to them and start playing too. No questions asked. You were just accepted. At some point in adolescence, the differences in our backgrounds start creating these divides between us. You start noticing where you belong (and where you don’t belong). At some point, you learned that it’s suddenly become weird to go up to a stranger and say, “Hey, will you be my friend?”. By the time you’re an adult, it’s so hard to make a new friend. It is for me anyway. The thing that’s amazing about the stars is they bring out that inner child in every single person who receives them. These stars are not only gifted in masses at festivals, but to people I meet in day-to-day life. A friend kind of twisted my arm always trying to get me into glass art. I was really busy and not that interested until one day she brought it up again and I thought maybe it would be cool to make a glass star. As a person who is both artistically and mathematically minded, I am an incredibly obsessive perfectionist. I hate looking at my paintings because all I see is their flaws. I double-triple check all my work in fear of ever being wrong. I may be the most “worryingest” girl you will ever meet, I worry about everything and am so self-critical. Sometimes I’m surprised I have any friends at all, I’m probably such a drag to be around. The stars were different. I loved looking at them. I became really obsessive, making star after star after star. 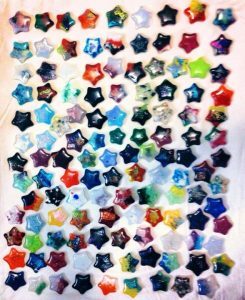 Before long I had hundreds of these little glass stars and I just loved picking them up in handfuls and admiring each of them again and again. However, I was accumulating hundreds of stars and I kind of didn’t know what to do with them, so I just sort of started giving them to people. Of course, I considered selling them at first, people offered to buy them, and still continue to, but I never sold one. Thank god. I’m so glad I can say I never sold one because I think that’s one of the things that I think keeps them “pure”. In this society where so much is about ego and money, I’m thankful to keep the stars separate. So, I just continued to give them to people and hopefully, I’ll continue to be in a position to keep giving them for as long as I live, because I think they are really special. The whole project has been kind of a god-send since I’m so shy and apparently such a difficult person to get to know. Small talk is really hard for me. People think I’m weird (and not in a cool way), but now I get a pass on that. When I sit next to someone on an airplane, I get to skip that awkward period where they are acknowledging you, but you don’t really know if they want to actually engage with you. It always bothered me, that the universe may have distributed that person to sit next to me on this plane for a reason, but I’m just reading my book. Now I have a solution, I just pull out a bag of stars and say, “Hey, look, I have a bag of stars and I give them away to people for free, which one do you want?”. Whoever sees them turns into that little kid on the playground. EVERYONE loves looking at, and picking out a star. It doesn’t matter who they are. I have seen the most tired business men, all stuffy looking in their suits turn into beaming little boys so happy to get to be playing with stars on a plane. They are so thrilled to be able to take something home to their kids who miss them because they travel so much. It’s the best. -Any funny stories or challenges in the creation? I’ve gifted thousands of stars now for years. I’ve gifted them to homeless people, kids in hospitals, neighbors, people who just got out of prison, astronauts, rich people, poor people, blind people, waiters and waitresses, the tow truck driver, my cat’s vet… sometimes I even leave batches in random people’s porches. One story that has always made an impression on me, was I was at this music venue that was run by a group of felons, people who had clearly had rough lives, been to prison, and were trying to make a new path for themselves in life with running this business. A bunch of college students were celebrating their recent graduation from a very prestigious university at this venue. I happened to be at this place with an unusually large bath of stars so I busted them out all over a table and everyone swarmed around. The observation I made was that I noticed that the newly college graduates would look at a star and say, “THAT is the one I want. THAT is the star for me” and they would take it with confidence and be really enthusiastic about it. The people who had been in prison, that ran the venue, hesitated. When they saw a star they liked, they said “I really like this star but I don’t want to take the best one”, and I had to assure them that they really could have whatever star they wanted, that all these stars were going to strangers and yet they continued to behave as though they didn’t feel like they should take the star they liked the most. -Anything you want to say about yourself/the creative force about the piece? I’m really boring to actually talk to when you get past the stars.